If you are thinking to relocate in this part of Texas, whatever your taste is, San Benito has it all. May it be tranquil tropical residences, spacious resaca waterfront or beautiful traditional country homes, there are a total of 70 exclusive subdivisions and country clubs offering the perfect house for you and your family. San Carlos Estates is one of the more exclusive residential areas offering luxurious single family homes with spacious lawns. Affordable beautiful single to multi family home neighborhoods includes San Carlos South, Edgewater Isle, Resaca Paloma, Hunter’s Crossing, Rio Bend Estates, St Francis of Assisi and Liberty Estates.. 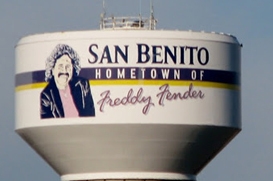 Famous for being the birthplace of Country and Tex-Mex music icon Freddy Fender, the City of San Benito is in Cameron County. It is located in the most southern tip of Texas, right in the heart of the Rio Grande Valley and adjacent to Mexico. The community’s idyllic border town location is conducive for commercial growth and perfect tourism and trade for its proximity to the (NAFTA) Free Trade International Bridge which connects Texas to Los Indios, Mexico. This bridge enables new enterprises and stimulates existing businesses which creates a welcomed spike on San Benito’s economy. Residents are provided with a solid education system brought by the San Benito Consolidated Independent School District, which is also one of this city’s top employers. Being in the State of Texas, residents can also access its different college and university systems such as University of Texas System, Texas A&M University System and Texas State University System. There are also a lot of community and junior colleges and technical training centers. For recreation and leisure, San Benito boasts various parks offering an assortment of outdoor activities which you can enjoy with the whole family. There are also a wide choice of facilities for arts and culture including The San Benito Museum, Narciso Martinez Cultural Arts Center and more. San Benito is a place that will surely nurture every single member of your family. Call us or email any inquiries regarding this beautiful Texan border city.